At no other time in the Panerozoic were collisions between continents so widespread. Beginning in the Mississippian and continuing into the Pennsylvanian, the Hercynian Orogeny occured. During this time, there were many collisions between Baltica and South Europe, and between South Europe and Africa. In addition, terranes were beginning to accrete to the western coast of North America, creating the Cordillera. 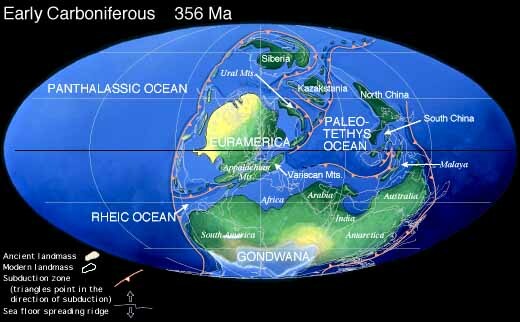 But by far the most important collision was the collision and suturing of Gondwana to Laurentia, a major step in the creation of the super continent Pangea. The gathered continents and landmasses were spread from the South Pole to slightly above the equator. For most of the period, Laurentia (ancient North America) and Baltica (ancient Europe) were positioned equitorially, resulting in a landmass with humid, tropical conditions year-round. This created an ideal climate for the proliferation of plant life.